Howdy,everyone? I hope your week has been great so far? Well, mine has; I’ve been enjoying myself so far. I have learnt to take life one day has it comes, not stressing or worrying or thinking. With that Life has been beautiful. Anyway, I have a great song for you guys. This song is my personal favourite and it’s the perfect song to walk down the aisle to or even as a couple’s first dance. 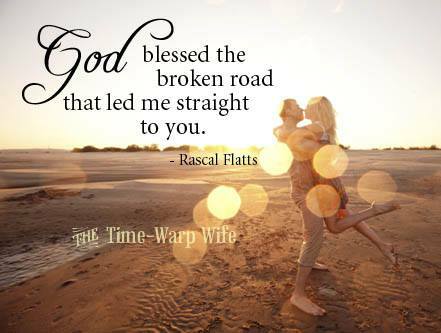 It’s titled Bless the Broken Road by Rascal Flatts. I also discovered this song years back through a couple I admired. The words are oh so powerful.